DADAA is located at the Fremantle Old Boys School in the East End of Fremantle. The premises are still undergoing the final stages of completion, which will include a contemporary art gallery and cafe. At present, studios are open and workshops, mentorships and other arts programs take place in this location. DADAA Fremantle is located in the Fremantle Old Boys School. An exciting new partnership with the City of Fremantle has allowed us to better align with the City of Fremantle’s current Economic Development Strategy by strengthening DADAA’s contribution to ‘knowledge-based’ and ‘population-based’ industries. The expanded hub provides a stronger sense of place, a more vibrant public arts program, and a more accessible arts and cultural plan for the whole community. The following venues are located at the Old Boys School. Some spaces are available for hire. 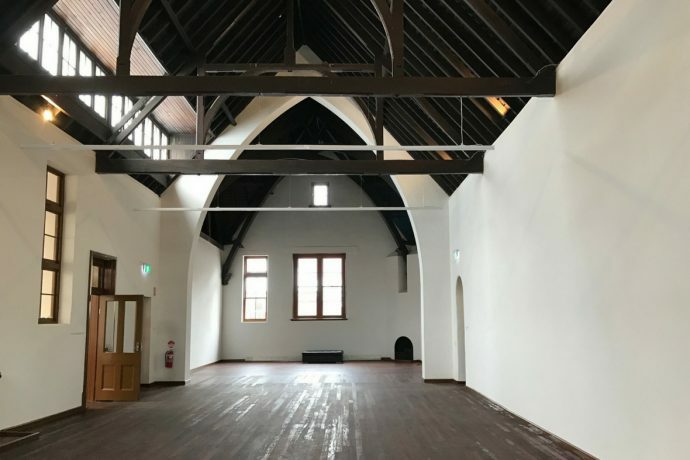 The heart of the Old Boys School, this is the largest space in the building and has been stripped back to its original form. Go to Space to Co to learn more about this venue and to hire it for your group activity or function. Home to PianoEasy during school terms for 40 weeks a year, DADAA and other groups use this space for the remaining 12 weeks during term breaks. We consider requests to use this space on a case-by-case basis. A vibrant space for DADAA weekly workshops across all visual arts forms. DADAA’s digital workshops and programs take place in this studio. Not yet opened, the gallery space is still undergoing renovation and, at this stage will open late in 2018.